Some claim that there’s no true defense against a handgun in martial arts, but I’ve never believed this. I understand that defending against a gun is a deadly moment filled with risk, but if someone is pointing a gun at me I’m already at deadly risk. I know that by training in multiple approaches to disarming I have at least improved the odds of surviving an encounter with a gun-wielding attacker. Gun disarm is part of our WMAC curriculum, and I’ve trained and practiced these techniques. But whenever I think about gun disarm, whenever I imagine myself in a situation where I might be confronted by an armed attacker at close range, I have a recurring fear, and it isn’t that I would fail in the attempt to disarm. Rather, my repeating nightmare is that I’d disarm my attacker and end up in possession of the gun, and my attacker would advance on me and try to recover it, and (in my nightmare) I’d have no choice left but to turn the gun on my lunging attacker...only, because I don’t know anything about real guns and have never held one, I’d pull the trigger and the gun wouldn’t respond, because the safety latch is on and I don’t know how to tell if it’s on or how to switch it, and in the split second I stand hesitating, the attacker will recover the weapon and I’d lose my moment of control. Because I have been unable to rid myself of this recurring nightmare in any other way, I finally went to a gun range to learn how to shoot a handgun. Gun ranges are rare in NYC, maybe they don’t exist at all. But in Florida it seems that they’re in almost every strip mall, and since I travel to Florida every few months to help care for my father, I took advantage of a recent visit to look up the closest gun range, which turned out to be a three-minute drive from my parent’s home: as I said, in every strip mall. 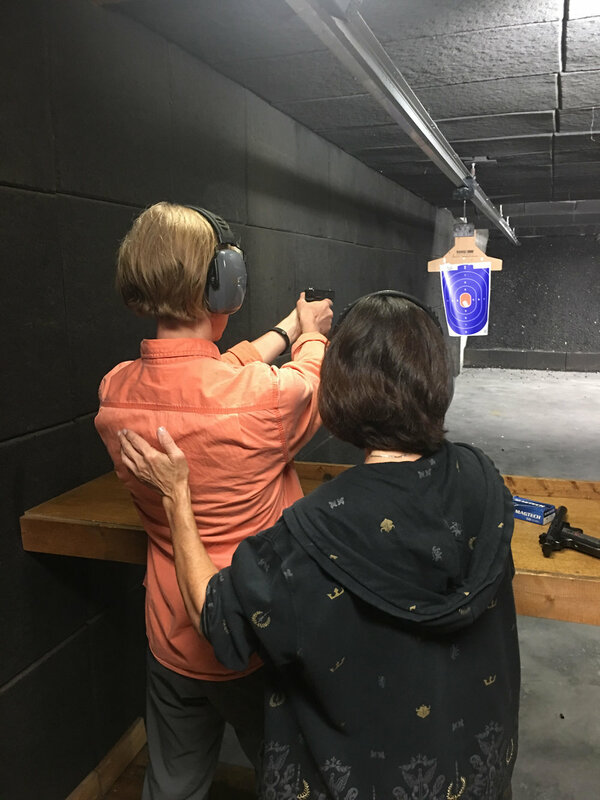 I signed up for the Basic Firearms Course, “designed for all levels of firearm owners or prospective owners.” The instructor was a cheerful woman sporting a holstered pistol tucked into the waistband of her jeans. 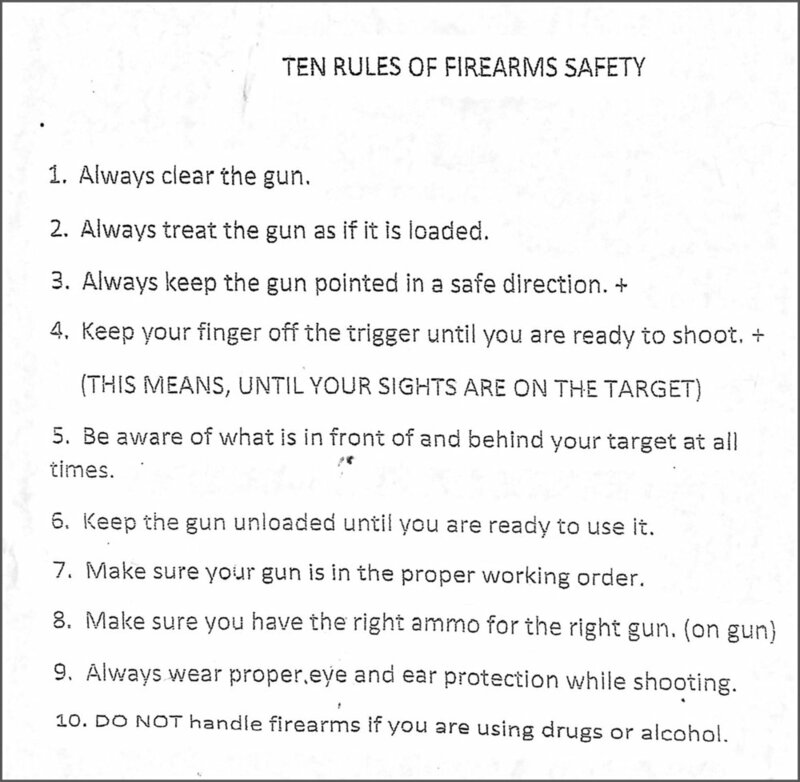 She started by handing me a photocopied list of Ten Rules of Firearms Safety (#3: Always keep the gun pointed in a safe direction. #5: Be aware of what is in front of and behind your target at all times). After reviewing the rules, she produced a 9mm handgun and proceeded to show me how to disassemble it, how to tell whether there was a cartridge in the chamber, how to load. Much to my surprise, she told me that many handguns don’t have a safety switch; so much for my recurring nightmare. Then she lead me through a door in the back of the shop and onto the shooting range. After donning ear protectors and a final review of the gun parts, my instructor handed me the gun and talked me through loading it. Then it was time to face the target and fire. First impressions: the gun was lighter than I expected (“they’re mostly made of plastic,” my instructor informed me). And, when I pulled the trigger, that thing really kicked in my hand. I fired round after round, and each time the recoil seemed to come as a surprise. I definitely see how people can end up shooting each other unintentionally, because unless you keep the gun under control it’s going to point pretty much wherever it wants to, which may not be where you want it to point. While I was taking my lesson on the shooting range, other gun owners were arriving for their own range time. “Some people come in every day,” my instructor noted. I saw two elderly couples, one young man (light skinned) and a second young man (dark skinned). Each arrived with their own weapons, handguns of various types, and boxes of ammunition. The etiquette of the gun range appeared to be, “shoot in silence, stay focused,” so I never had a chance to speak to my fellow shooters. But they were clearly following some form of their own personal practice. My lesson ended with the instructor congratulating me on my target accuracy. She told me that I was a natural, but perhaps she said that to every student. I do have proof that I hit the center of the paper target quite a lot. I now knew how to load, clear, and fire a handgun, and how to tell if there was a safety switch and whether it was on or off. I had demonstrated proficiency in the Ten Rules of Firearms Safety. And I now knew what it felt like to hold and fire a handgun. Photos from Sabumnim's 60th Birthday (there are 5 sets)!